Fun & Inspiration Why Do We Have Nightmares? When I was growing up, I remember certain movies or stories that would scare me. When you’re a child, it’s easy to detach from the reality of a situation and focus on the moment. It’s probably the reason why children get so scared, because they can’t separate what’s obviously reality from whatever seemingly terrifying experience they’re having. We’ve all been there, and we all have memories from our childhood that seem funny now, but were scary to our younger selves. It wasn’t until I got older that I realized there’s nothing more terrifying than my own imagination. It’s the reason I can watch a “scary” movie nowadays and not think twice about it, but when I dive into Stephen King novel, I almost can’t read it if my roommates are out of the house. What I see in my mind will always be more terrifying than whatever monster is created next in Hollywood. This is why nightmares can be horrible experiences; it’s just you and your mind alone in the dark. We can all agree that nightmares are scary experiences, but that doesn’t mean all bad dreams can be classified as a nightmare per say. 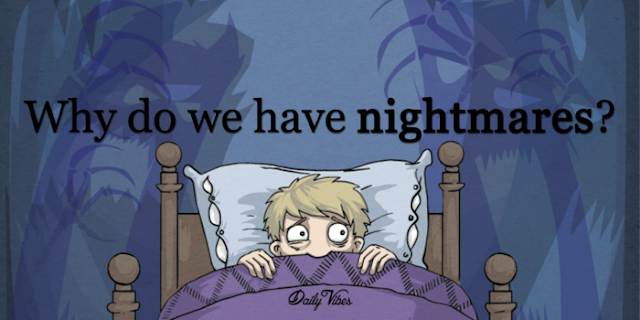 Night terrors, for example, aren’t nightmares, but have no clear structure or plot. These strike about midway through the typical sleep cycle, and they cause sleepers to wake up with an intense, but inexplicable fear. If you’ve ever woken up sweaty, breathing heavy, and afraid but have no clue as to why, you’ve experienced a night terror. Nightmares, however, have a little more structure to them and are experienced during the rapid eye movement phase of our sleep cycles, or during REM sleep. They are more common than a night terror, and this is especially true during a person’s early stages in life like childhood or adolescence. It’s estimated that between 5 and 8 percent of adults have nightmares that are recurring, while 20 to 39 percent of children under the age of 12 suffer the same. These statistics are pretty normal, and nightmares are expected to occur for everyone, not just children, especially if something troubling was experienced during the day. However, things can become problematic when nightmares start to take over. When nightmares start to have an impact on your days and keep you from sleeping at night, this is called nightmare disorder. Nightmare disorder can be brought about through a variety of means, including post-traumatic stress disorder, or PTSD. People who have been through traumatic experiences in their lives often feel the effects of these experiences while they sleep. This is typically the case for combat veterans, and a recent study showed that 80 percent of those who suffer from PTSD report having regular nightmares. The important thing to remember is that nightmares are just dreams. They are projections that our subconscious creates due to what we experience through our everyday lives. Although nightmares and dreams in general remain largely a mystery, they can be fairly good indicators for how we’re handling things in life. Unless your nightmares become a serious problem or you’re suffering from nightmare disorder, you should pay attention to what your brain is telling you during sleep. Although they’re scary at night, they might be helpful during the day.